Automatically send your leads from a Lander landing page to a VerticalResponse list in 3 simple steps. Are your email marketing lists lacking luster? Need to energize them with new leads? Link your VerticalResponse account to your Lander lead generation landing pages and your lists will automatically be replenished with every new lead generated. Go to the Integrations section of your Lander landing page and select VerticalResponse. Login to your VR account from the pop-up. That’s it! Now your leads will automatically go to your chosen VerticalResponse list. Forget about downloading and uploading contact lists and losing leads in the process. Now, whenever you capture a new lead from your form on a Landing Page built on Lander, the lead will be automatically uploaded to the list you selected from your VerticalResponse account. 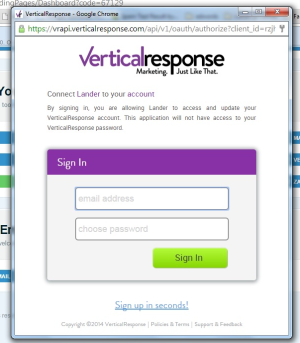 If you have an account with the Email Marketing platform, VerticalResponse, this post will show you how to easily integrate your Lander landing page forms so you can send leads captured on Lander to your email lists in VerticalResponse. Ok, let’s get started! First, you need to access the Dashboard of the Landing Page you want to integrate with your VerticalResponse account. Next, scroll down the dashboard and look for the Integration section towards the bottom and select the VerticalResponse option. Then, just click on the button there and you'll see the integration window. Once you've completed that action you’ll next see a window that will ask you to log into your VerticalResponse account. Inside the open window, just add your Email Address and your Password. Finally, just click on the “Sign In” button and the Integration will then be ready. Once you've completed all of the above just select from the dropdown the List that you want to send your leads to. After selecting from the dropdown, just click on the Update button, and you’ll see that the VerticalResponse button turns green, this means that it’s all set and ready to go. Now, whenever you capture a new lead from your form on this Landing Page, the lead will be automatically uploaded to the list you’ve selected from your VerticalResponse account. It just couldn't be easier right?